On November 7th, we presented at the Bits&Chips Embedded Systems conference, the key embedded systems event in the Netherlands. This 12th edition saw over 500 attendees, 50 exhibitors and over 30 talks. 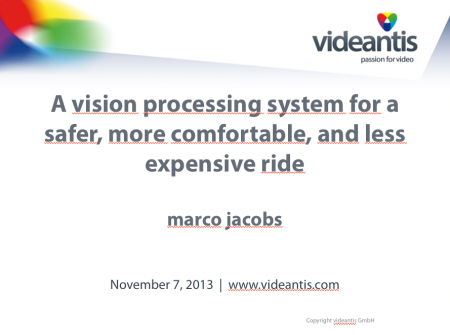 Marco Jacobs from videantis presented one of the sessions, and gave a high-level overview of the role that computer vision plays in the automotive industry, talking about market drivers, automotive vision sensors, in-vehicle networking, feature detection, and the videantis efficient vision processing architecture.